I know, I know. I'm late to the party. While we still have kids who look for and enjoy Lauren Tarshis's I Survived series, the heyday of its popularity is starting to pass here. But I had some ideas, so I wanted to do this program anyway. And since SURVIVAL is a pretty popular topic ANYWAY, I had great attendance and it was a really fun time. I aimed this program at kids in grades 3-5, thinking that was the age most likely to be familiar with the series. I ended up with about half the attendees familiar and loving the I Survived series and about half who had only casually read one or two of the books or who hadn't read any of the books. It didn't matter whether kids had previously read any of the books; this program was designed to appeal to everyone! I chose three I Survived books to feature and came up with a related activity for each book. I started the program by reading just the first chapter of each book and booktalking some related titles in between. If you're not familiar with the series, each I Survived book starts with a bang - the first chapter is designed to hook the audience and present the drama of each disaster. That makes the first chapters perfect for booktalking and reading aloud to spark interest. 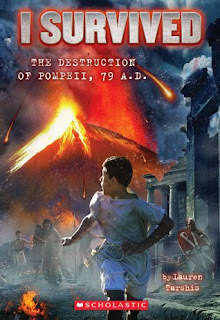 In between each reading, I booktalked related books, featuring a few books about volcanoes, Titanic: Voices from the Disaster, and the two nonfiction I Survived Titles: Five Epic Disasters and Nature Attacks. After our readaloud, I opened the room up for kids to explore our activities. Since I did this as a drop-in program, having mostly self-directed activity stations was a great way to accommodate whatever number of kids I would have. I did have one additional staff member in the program with me to run our volcano station, which worked out really well. This could have easily been a teen volunteer if we didn't have a staff person available. This activity came from Amy Koester on the ALSC Blog and I had used it previously at a volcano program several years ago. 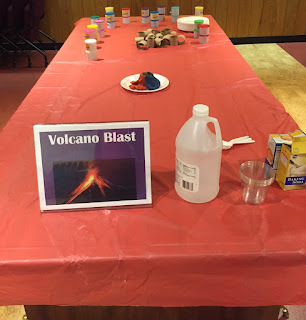 I purchased play dough from the Dollar Tree (you could also make your own play dough, which might be cheaper) and we used half of toilet paper tubes instead of the prescription bottles because we always seem to have those on hand (and they make for smaller volcanoes and less supplies). I had Mr. S run this station just to keep the mess of explosions at a minimum and to make sure our baking soda and vinegar would last through the entire program. 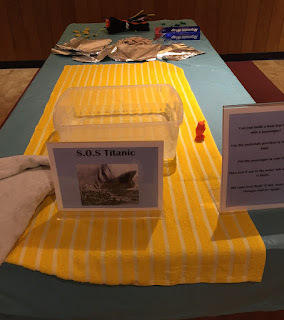 For this stations, I challenged kids to build a boat that would float while holding a passenger. I provided materials we had around our office: aluminum foil, craft sticks, pipe cleaners, modeling clay. You could use really anything you have on hand for this. I think my "passenger" was a little too light to really make this station challenging, but some kids really experimented a lot, trying out different designs and materials. 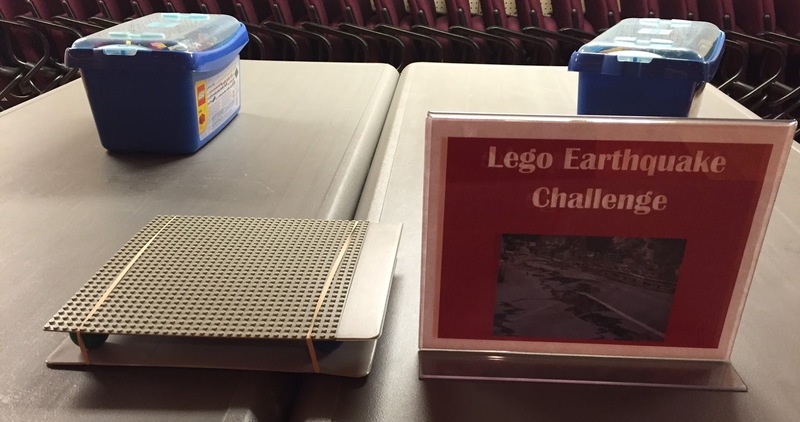 Legos are always super popular and kids enjoyed building their creations and testing them out on the earthquake simulator. It wasn't very easy to actually stick the Lego buildings onto the base while it was attached to the simulator. If I tried it again I might take the base out for each new building, especially if I had staff or a volunteer to specifically man this station. I was surprised at how many kids stayed for the entire program and spent a lot of time visiting the stations. Of course, I had a couple who blitzed through the activities and then left and I had some kids arriving halfway through the program, but since the stations were all self-directed that was fine. And of course I put out a huge book display with lots of I Survived titles and other survival books that kids were encouraged to check out.